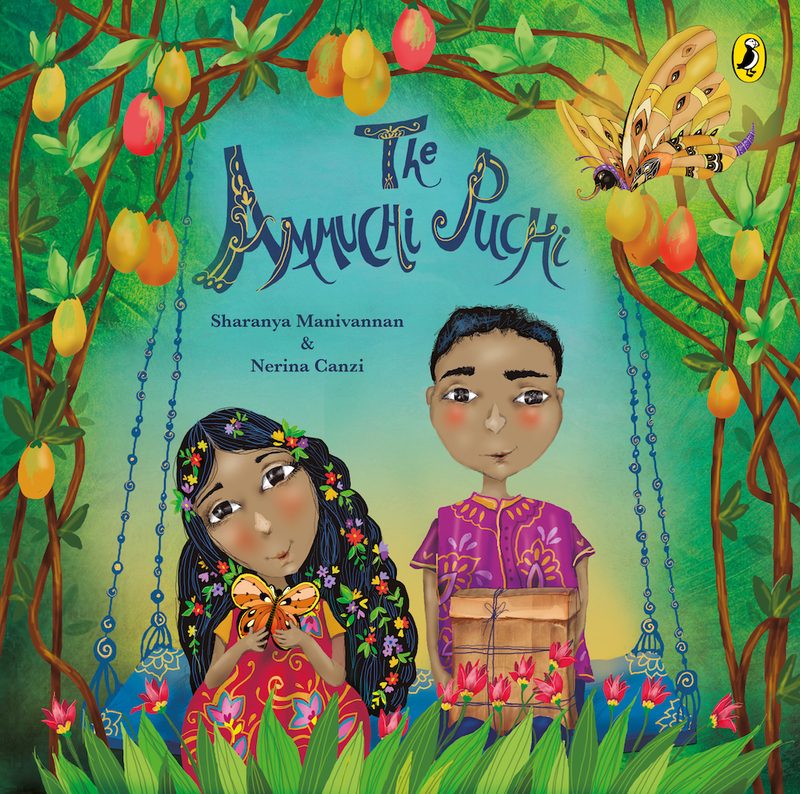 Sharanya Manivannan ‘The Ammuchi Puchi’ deals with a difficult subject with tenderness. She wore gold butterflies in her hair, long hair falling in waves over her shoulders, back and waist. Little butterflies fluttered on her summery cotton sari. I was certain I’d find butterflies wafting in the air. But it was only the children smiling with Sharanya Manivannan, as they clustered around her, eager for the story. Manivannan is a performance artist par excellence. She doesn’t just narrate with feeling. She gathers words into herself, becoming the persona, the voice, even before she gets on to the stage. That sultry late-afternoon at the Iloveread.in library in Adyar, Chennai, was no different. Except that for the first time I would be watching her bring forth not poetry but a story to life, for a bunch of children. I thought I wouldn’t be able to hear her voice, as soft as a butterfly’s wings, above the bouncing heads of children. But I did. And that’s a curious thing. Mannivanan never throws her voice at her audience. From across the small hall, her voice arced out like an intimate whisper, the same volume whether you were crouched around her knees like the children were, or seated in the furthest corner like me. Listening to Sharanya Manivannan tell her story The Ammuchi Puchi, along with Srishtika, a trained story teller, who mimed and role-played while Manivannan narrated, I thought this was something that I had not heard before, even though I had! The language of grief and loss is universal. It can be as tender as you can make it. Or it can be lacerating. Both are heartwrenching. Manivannan chose tender. The book begins with a lacing of fear, an unusual way to begin, especially for a book whose back cover advertises it as a “poignant and moving story about bereavement and grief.” But then Manivannan is no ordinary story-teller. The old hackneyed tropes of grief don’t work for her. What she manages to achieve in fact is something far richer in the first two lines. 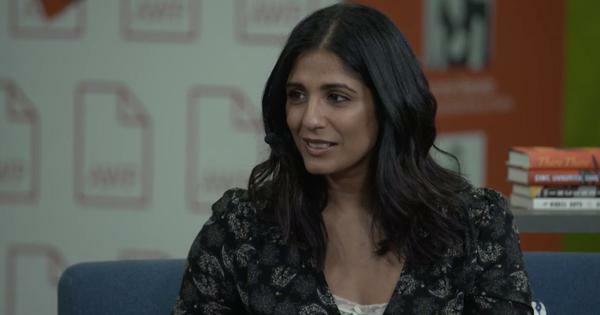 She succinctly manages to convey the complexities of human relationships, and the fact that love is never a straightforward emotion, through the voice of a ten year old boy, Aditya, Anjali’s older brother. Like Manivannan’s poetry, which often hovers between two worlds, the physical and natural, and the preternatural and magical, The Ammuchi Puchi story flits across the borders without losing credibility. For example, when the two children were very young their grandmother told them about the ghost in the mango tree, relying on their childish imaginations to bring her story, her little fun at their expense, to life. But as the children grow older, they begin to play along, telling ghost stories themselves. And, they also begin to understand that underneath her loud laughter and banter beats their grandmother’s loving heart. After this, for a brief two pages, the bright colours melt away from the book, leaving behind a swatch of sombre grey. This is the colour of bereavement, after Ammuchi’s sudden death. And Aditya’s voice trembles in the words that Manivannan lays down – six lines, just six small lines, sunk deep into grief. Children though, will seek out sunshine. For that is the way of children. And one day Anjali spots a butterfly. Not just any butterfly, but one which looks almost exactly like her brooch. And even though Aditya is sceptical at first, he understands how special the butterfly is. But children have to negotiate the world of disbelieving grownups. As well as that of their “not-mean, not-kind” peers. Likewise with Aditya and Anjali, and it hurts. But the butterfly helps them cope by being there, with the two of them. In The Ammuchi Puchi Manivannan demonstrates that even a difficult children’s theme – death of a loved one – in this case, can be handled with sensitivity and made emotionally accessible, no matter how young the reader is. My one point of contention, however, lies in the illustrations. Although lush and rich, Nerina Canzi, ought to have taken care to understand the background of the characters better. Not all Indian children go to schools where they have to sit on the floor with lap desks. Especially not those who clearly come from a well-to-do background – in the story they even have a piano at home, apart from the other usual things that a normal well-off family would possess in India. I hope the publishers will look into it for the next edition – and yes, I do expect this book to go into many editions, and enjoyed by more and more readers, young and old alike. The Ammuchi Puchi, Sharanya Manivannan and Nerina Canzi, Puffin. Shikhandin is the author of a book of stories – Immoderate Men – and a children’s book – Vibhuti Cat.